By Meredith Chilson on April 13, 2013 Visit Meredith's Website. At a craft fair last fall, I struck up a conversation with a young woman—one or the other of us mentioned chickens—and you probably can guess what happened next—we talked until the people around us were beginning to tap their feet and give that “oh, no, she’s talking about chickens again” look to one another. So, we swapped names (hers is Cynthia) and contact information (more about that later), and in the late winter when her chickens weren’t laying yet and mine were, she came to my house for some fresh, organic eggs, and we talked again. We didn’t just talk about chickens, although they were certainly part of the conversation. We talked environment and small-scale farming, gardening and knowing what’s on your plate, sustainable living, recycling, and organic feed. 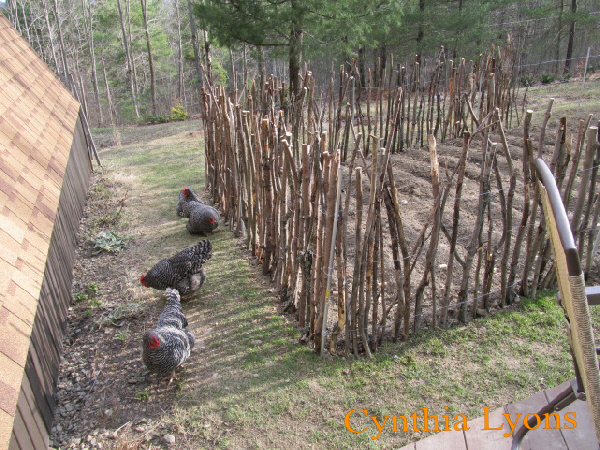 Turns out, Cynthia has some good, healthy, practical ideas so I asked her to tell you a bit about her experiences… particularly as they pertain to the use of chickens in her garden. Three years ago, I decided to become a chicken farmer. Maybe it’s in my blood (my Grandpa had chickens.) 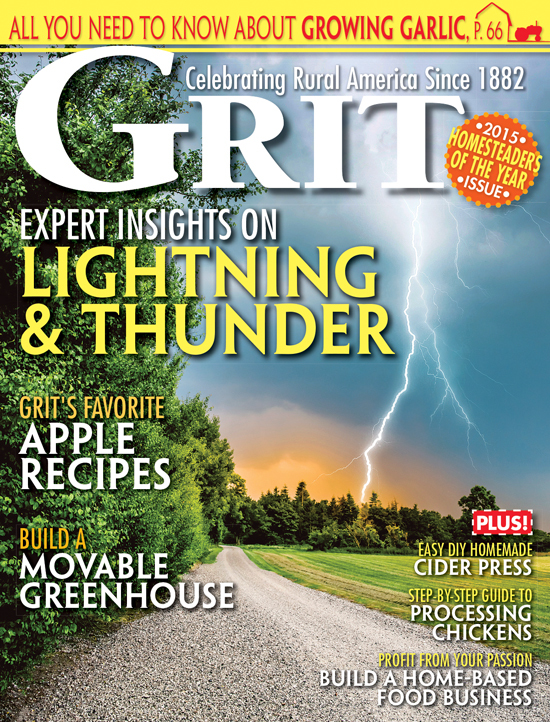 I wanted to become more self-sustainable, and know where my food was coming from. 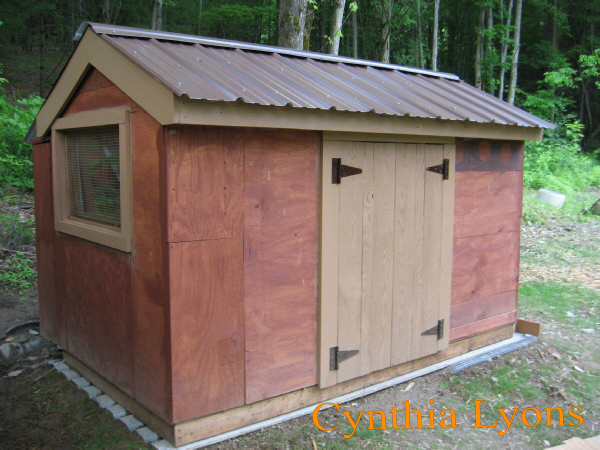 I also had a great amount of scrap lumber that would be perfect for making a chicken coop. I had read numerous articles that chickens are good for gardening. I already had a good-sized organic vegetable garden. Chickens would definitely be beneficial, according to all the articles. So, I built the coop. I’d like to say that it didn’t cost anything (remember, I had scrap lumber.) However, by the time I bought the roofing tin, a couple of two by fours, and door hardware, I had invested some money. 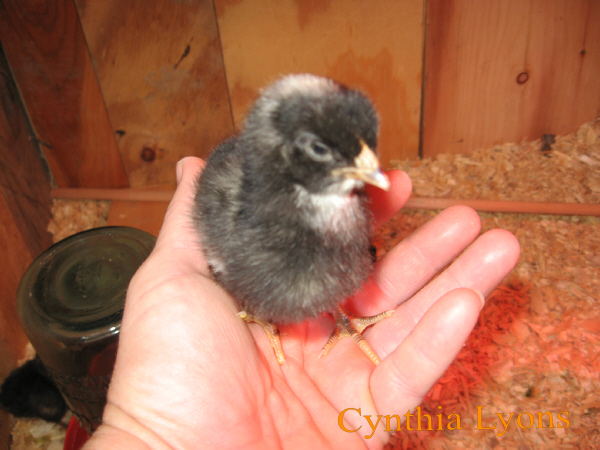 And, what finally made me order the day old chicks was that My Pet Chicken was having a ½ price sale on Barred Rocks! I LOVE a good bargain! 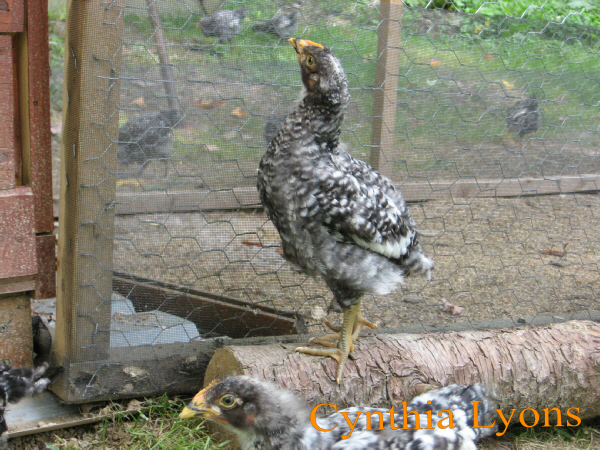 Fast forward about two months- the now seven-week-old chicks were first let out on their own! Seven weeks old–and ready to garden! They were officially free-range hens! And, wow, do they free range! I’m amazed at how far they do venture. 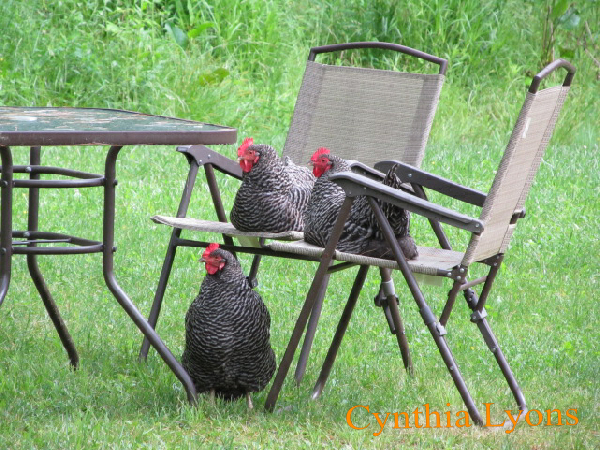 Free ranging hens–waiting for lunch? Now, refer back to one of the reasons that I decided to raise chickens- they are supposed to be good for gardening. Well, I’m going to have to say that free-range chickens are not good for gardening. 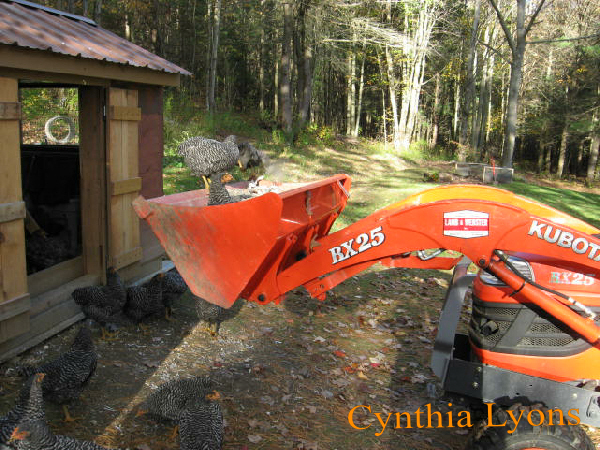 Chickens like to dig in fresh soil, and dust bathe in loose soil. So the seeds and seedlings don’t stand a chance with the excavating birds. And, chickens like to sample the growing vegetables, and will eat tomatoes off the vine. They also like to dig in mulch, and around the bases of shrubs, so there is no nicely manicured landscape with free-range chickens. I’ve also lost a few shrubs, because they’ve damaged the root ball. I had some two-foot high fencing around the gardens. Chickens are smart, though. They learned how to fly up onto the posts, and over. Now, I’m finding myself having to build higher fences. I love having fresh eggs from healthy, happy chickens. My chickens (I now have six), have become pets, and provide quite a bit of entertainment, and are a great topic of conversation. However, as far as chickens being good for gardening, I’m going to have to say that I don’t agree! Do you let your chickens help you garden? What are your experiences—if you’d like to “talk chickens” with me and possibly even share your thoughts with Community Chickens –let me know; leave a comment. If you’d like to talk with Cynthia, and see what other things she is doing to live a more sustainable life, you could check out her new website at www.dandelionpetals.com. Thanks, Cynthia for sharing your story!